When you enter the world of Bible Journaling, you find that there is an endless list of supplies available. It can quickly become overwhelming and pretty costly. If you know what you actually need for Bible Journaling supplies and can keep within your budget, it can be so much fun and a creative way to bring more meaning to your study. Don’t forget why you are Bible Journaling in the first place – to spend more time in the Word. This is not about taking a verse out of context just to create a pretty painting. Don’t worry about perfection and just focus on God leading your time. 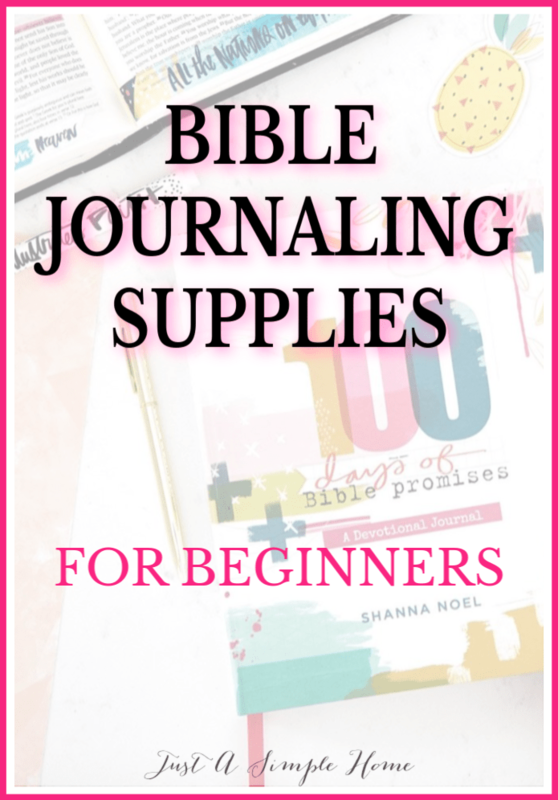 These are some supplies that I recommend when you are getting started with Bible Journaling. You do not need to go out and purchase a bunch of things! Look in your home and see what you already have on hand. Then, choose a few things you really need or want to purchase and build up your stash of supplies slowly. If you are purchasing your supplies online and use our links here, Just A Simple Home will receive a small commission, which will go to creating more quality content for you. PAPER OR NOTEBOOK– This is completely your preference. You can journal in your Bible or use a journal that you already have. If you don’t have a journal, any notebook will do. COLORING PENCILS – any low cost colored pencil set will do; just make sure not to sharpen them too much. HIGHLIGHTERS – if you will be highlighting in your Bible, you may want to look below and get a specific kind of highlighter. If you are journaling in a notebook or plain journal, you can just grab a cheap set at your local store. GEL PENS – This depends on what you are journaling in, but any set of pens should do. You can choose a colored set or to write in black only. PAGE PROTECTOR – You can make your own journaling mat out of a dollar store place-mat or just use a thicker piece of paper to protect your pages if you are journaling in your Bible. Illustrated Faith: https://amzn.to/2MM2zpN You can even just use a piece of notebook paper. PAINT– If you don’t already have paint in your house, you can buy the 50 cent acrylic paints at Walmart to start, or a cheap watercolor set. JOURNALING BIBLE – I have and use a few, depending on the day. I love the ESV Journaling Bible, The Jesus Bible, and the HSCB Notetakers Bible. I am also drooling over the newIllustrated Faith Illustrating Bible! COLORING PENCILS – my favorite soft-core pencil is the Prismacolor Premier Colored Pencils. They are a bit pricier, but will work well and last a very long time. 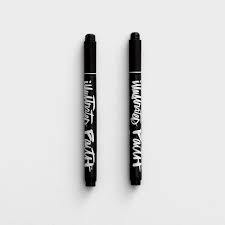 BIBLE HIGHLIGHTERS – any non bleed highlighter will do, but these highlighters are specifically designed for Bible study. I also recently received the Daily Grace Erasable Highlighters and so far, I am loving them! GESSO – Helps eliminate bleed through and works well if you’re using a lot of water in your Bible. I use the Prima Marketing Gesso. BIBLE JOURNALING MAT – I use this mat HERE to protect the other pages in my Bible. GELLATOS – Pricey, but a little goes a long way! There are many different colors, and you can start with just a few in a pack of four or you can go all in and get a large pack. WATERCOLORS –Kuretake watercolors are a favorite of mine. I also frequently use the Illustrated Faith watercolor set, since it is so compact and easy to travel with. PRECISION PENS – The Sakura Pigma pen set works well as a Bible set. You can grab them on Amazon, and I have found them at my local Christian store. I also use the Illustrated Faith pens to journal and write in dates in my Bible. 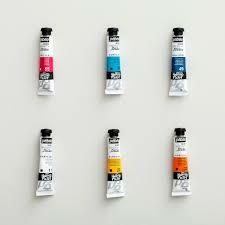 ACRYLIC PAINT – This set HERE is a great set of acrylic paints. You may also want to check out these acrylic tubes. WASHI TAPE – I love the Illustrated Faith washi tape. They are just so generous and I never seem to run out. They also have a great set of highlighter washi tape if you prefer not to use highlighters in your Bible. I use this washi tape in my planner too and love it. I tend to use a few Bible Journaling Kits each month. You absolutely do not have to use a kit, but I find it makes the process easier for me. I can focus more on the Scripture and less on creating a picture. Most of the kits also come with devotionals or Scripture references, which can give you a starting point if you don’t know where to start. Check out this LIST OF MONTHLY BIBLE JOURNALING KITS HERE. 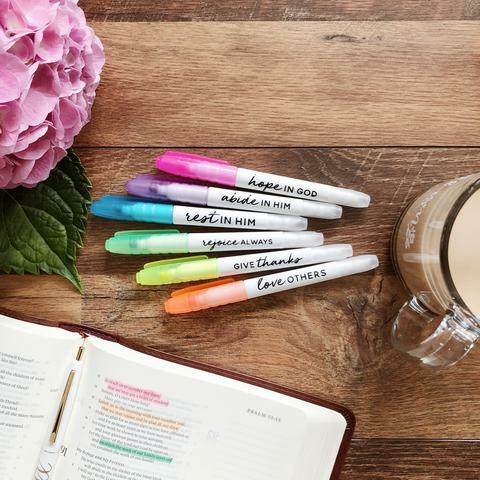 What are your must have Bible Journaling supplies? JOIN OUR FREE COMMUNITY FOR BIBLE JOURNALING HERE! Wow what a great list!! I am still trying to dive into it but I get so nervous about wrecking my journaling Bible with my lack of artistic ability lol. Thank you for sharing this!! Oh wow I love crafting and now I can do it during my “me” time with the Bible! I’ve done a style of Bible journaling for so long that I’ve always been hesitant to change up, however I do feel that using different colors for different topics or so you know exactly what that color means to you is a good idea. I first came across this form of detailed journaling in a book by Kay Arthur. I think I’m putting colored gel pens on my shopping list after seeing your list. There are definitely several supplies you mentioned that I had not taken into consideration! I am a journal in a notebook kinda gal because I don’t wanna mess up my precious Bible, but I can attest to the gel pens! I started off with coloring pencils and markers, but have loved the look and feel of the gel pens. I also LOVE washi tape! Thanks so much for sharing about the other supplies! Those gellatos look amazing! It looks like the perfect tool. What a great list! I have no artistic talent 🙁 It makes me sad because all I can do is use highlighters and washi tape from your list . I really like the look/sound of those highlighters. I might need to check into those. I recently got a journal Bible and have wanted to get some supplies just for it. So this is perfect and keeps me from over buying. My family is reading through the Bible chronologically this year. I have been using a regular highlighter to mark important verses, but the Bible highlighters you suggested would be great!